The 1958/59 season had seen us finish in a very creditable seventh place in what was manager Mr Harry Potts' first full season in charge. 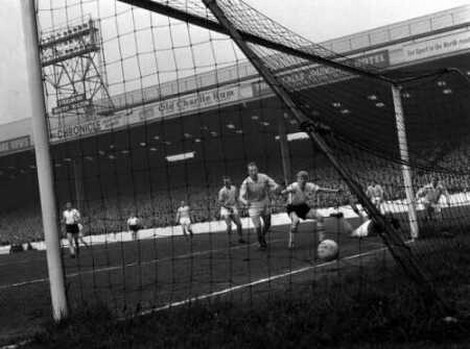 The new, 1959/60 season started with two wins, at Leeds and then the first home game against Everton. Those results left Burnley top of the league, even if for just 24 hours, and incredibly we weren't to top the league again until the night when we won the championship. This story has been one of great football, some fantastic wins and some disappointments along the way, none more so than the hammering at Wolves and the cup defeat at Blackburn. It all ended in triumph and it has been superb looking back over the past nine months or so, through a drought, a General Election, some rather strange events and the court proceedings of fifty years ago, all thanks to the coverage at the time from the Burnley Express. And so it is to the Burnley Express report of the night that we turn to relive the night of Monday 2nd May 1960, when Burnley Football Club became Champions of England for a second time. After 31 minutes play, Trevor Meredith, reserve outside-right for Burnley's England player John Connelly, blasted the Turf Moor club to the top of the First Division. It was left for 74 agonising minutes - including the half time period - until the final whistle confirmed that they were still there and had won the championship for the first time in 39 years. And it was at the Manchester City headquarters that Burnley reached the final of the FA Cup by defeating Liverpool in 1947. So Maine Road, that vast cold arena of draughts and concrete, for ever will be a ground of memories for North East Lancashire. The game was watched by 65,981 spectators. At least that was the number present. There must have been many who did not see every moment of the game. Many could not gain admittance at all and listened to the progress of the match from outside. If they were from Burnley it was still a great occasion; a night of triumph which was watched by Mr Stan Cullis, manager of Wolverhampton Wanderers, who had been robbed of a championship 'hat-trick' and a possible Cup and League double by that Meredith goal. Burnley had to fight every inch and every second. If City had been doomed to relegation and their very existence depended on them winning, the Light Blues could not have fought with more verve and energy. Burnley have been criticised in the past for appearing to take matches in too leisurely a manner. They could not be accused of any haphazard, easy-going negligence in this match. If they could not always dictate the play, they disputed Manchester City's attempts to do so. Perhaps the nearest approach to the pattern of terrier tackling which comes to mind in a fixture at Turf Moor is the Tottenham encounter. Neither side gave any quarter. They stormed in for possession irrespective of size and weight and it was inevitable that someone would get hurt. Strangely enough, each trainer made only a brief appearance. The players were too busy to note their bruises. No doubt they could count them afterwards though the Burnley boys were too happy to bother. Most serious casualty was Pilkington, the Burnley outside-left, who had been a constant worry to the City right flank. He is an expert at the acrobatic fall and he executed it with full dramatics on two occasions - to the baffled fury of the home crowd when the referee gave free kicks in acknowledgement of justice, pain and suffering. However, it was the final occasion, a few minutes before the end, when he was brought down and the injury was actual and serious and left him limping with a damaged ankle. But this time there was neither reward nor respite for the tide of battle flowed over him as City started one of their hectic attacks which always held the threat of an equaliser. A nervous start by both teams was not helped in ball control or accurate passing by the uneven and grassless surface of the pitch. Water had been applied during the morning but evidently not in sufficient quantities to subdue the bounce of the ball which went any way, according to the force and, if not always, general direction of propulsion. City began to suffer more from the greatness of the occasion than did Burnley, if their irresponsible clearances were any criterion. They had nothing to lose except match bonus and they played as if they wanted that and Burnley's as well if they could get it. They were fierce, but inaccurate with much of their work, while Burnley attempted to use the ball with some purpose. However, the visitors received tremendous encouragement from a shock fourth minute goal. It came from the eighth throw-in (that in itself being an indication of the liveliness of the ball as against the subdued skill of the players). 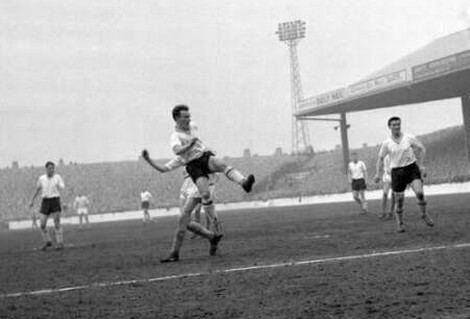 Elder and Robson pushed it on and PILKINGTON cut in along near the bye-line, hit a low centre across the face of the goal, the ball appearing to touch Trautmann, who had moved too near the post, and it finished inside the net by the far upright. City hit back with a tremendous attack as if scarcely believing that they could suffer such an insult at such a time. They hammered the ball down the middle and out to the wings, but Burnley were watchful as well as jubilant, and were not inclined to be caught by the sudden change of direction or the individual dart through. Their defence was far more compact than that of City, whose wide-open spaces must have looked particularly tempting to Pointer if only he could have received a ground pass to prove it. However, the ball was in the air a great deal and either 'heads up' or even 'feet up' tried to control its spirited destiny. The goalkeepers had the best time to shine and Trautmann revealed his old skill with two lightning interceptions from centres with Burnley dangerously close to conversions. A free kick midway between the half and 18-yard line brought a City equaliser. Law (who looked in an offside position) missed connecting properly with the chip over the defence and the ball bounced to HAYES, who gave Blacklaw no chance. Both Burnley wingmen were finding progress far from easy against the hard tackling and once Pilkington was brought down by a trio of light blue battlers. McIlroy, with strapping on his right thigh, veered and dodged and did his best to calm the hectic pace to one which could be moulded into some semblance of ordered skill, but what with the determined opposition of City he could find the skill if not the speed, but some of his evasive action was breathtaking and magnificent. 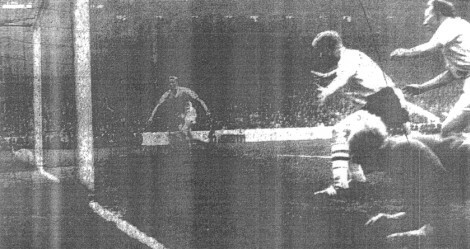 Trautmann made a blinding tip over the bar from Robson, who was destined to be robbed of a goal in the second half when the 'keeper diverted an over-head kick which looked a scorer all the way. Burnley scored their goal following a heavy Ewing foul on Pointer. Cummings took the free-kick, there was bobbing about on the mid-left and then Branagan sliced the ball into his own area where lurked that little opportunist MEREDITH, right in the thick of the fray, poised and waiting and he smacked the ball into the net just inside the post. It was during the second period of the game that Burnley really became on top. City still fought but the dominance of the Burnley half-back line told its own tale, despite some dazzling footwork from Law, the fair-haired Scottish genius with a remarkable change of pace. City tried the long ball down the middle from Ewing and the wing-halves, but Cummings, who played a great game in conjunction with Adamson and Angus, either met the challenge with head or foot clearances or pushed it back to Blacklaw - and certain criticisms from the City crowd, of course. This was the period of the Manchester roar - the indistinguishable, long drawn-out chant which had City trying the storming breakthrough - the race and chase moves in which the Burnley defence just won with inches to spare. City were dangerous too, with the push to the wing and diagonal pass or the square ball which sped towards hurtling heads and bodies in the Burnley goal area. Then it was that Blacklaw rose to the occasion with some darting snatches just as the crowd were breaking into the goal roar - and it was Burnley's turn to cheer as the ball was sent back into the City half - to give their defence something to be anxious about. The crowd at the covered end began to chant "White ball! White ball! White ball!" over and over again, for it was extremely difficult to follow the flight at times under the peculiarity of the Maine Road lights. And the referee signalled a change - amid a mighty cheer which pleased both friend and foe. But soon the tenseness returned. Burnley hung on to that precious lead. City fought for the equaliser - the vital goal which would re-make a Wolverhampton Wanderers championship. Time ticked on - 15 minutes to go. Burnley in danger from a Light Blues corner. Blacklaw turns another over the bar. McIlroy tries his own possession-keeping dodge near the corner flag. Then 10 minutes to go - another City corner, the attack broken and siege relieved by Miller, Meredith and Pilkington. Then eight left and Burnley foiled by Trautmann. A minute later, a City injury, play stopped and Trautmann takes the chance to confer with two defenders. Six minutes - a scoring opportunity for Law following a free-kick but he overruns the ball and Burnley breathe again. Five minutes - City still attacking and Blacklaw makes a brilliant intervention. Three anxious minutes left - a Burnley corner but City hit back again and once more Blacklaw saves the situation. At last the final whistle and a vast cheer rolls round the packed ground. Claret and blue supporters, blue and white also, ignore the police and converge on the players. Burnley receive the congratulations of the City, who have given them such a tremendous tussle. Who cares that the ball was out of play 84 times for throw-ins that Burnley had 11 free-kicks to Manchester's 14? Burnley won the match, the cheers, and what is more, the championship. Manchester City: Bert Trautmann, Ken Branagan, Cliff Sear, Ken Barnes, Dave Ewing, Alan Oakes, Colin Barlow, George Hannah, Joe Hayes, Denis Law, Clive Colbridge. Referee: Mr T. H. Gerrard (Preston).